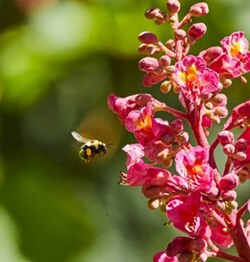 A bumble bee flies to a buckeye. It was cool and windy when my friend and I went for a walk at the Humboldt Bay Wildlife Refuge. Large flocks of geese attested to the success of conservation efforts over recent decades. Egrets, grebes, ducks of several species, mud hens and one of my all-time favorite song birds, bi-colored blackbirds, put in appearances. Along the way, I noted a small, shiny green beetle scurry across the path in front of us. Of course, I had to stop and get a better look and snap a picture. It was a ground beetle unlike any I'd seen before. At home I couldn't find it in any of my beetle ID books. I sent a photo to www.BugGuide.net and got a prompt response that this was a beetle of the genus Poecilus. 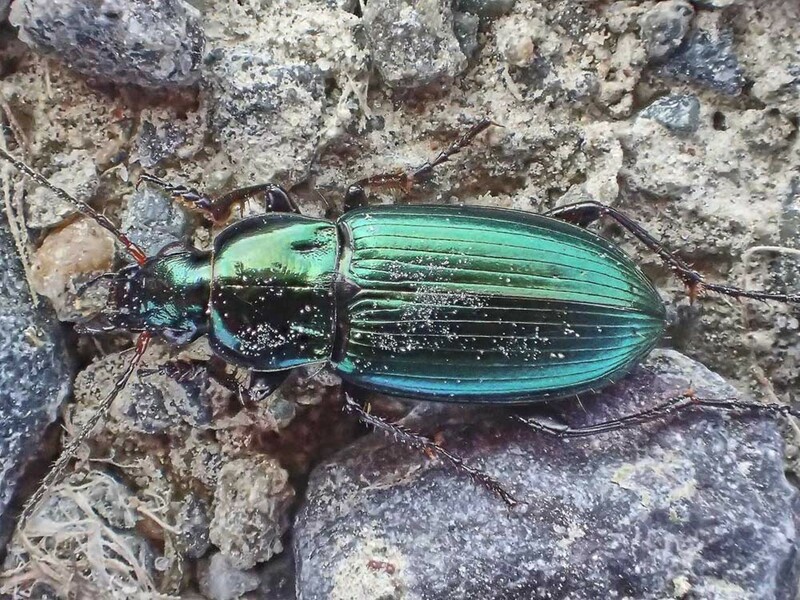 I haven't been able to find much information on them, so I assume they are either poorly known or their history is pretty much that of other ground beetles. Most likely it is an under-the-rocks predator. Like many photographers, I suffer from gadget-itis and I'd just scratched the itch by buying a StackRail — a computer-controlled, motorized, camera-positioning device that advances the camera between exposures. Taking a great many photos at slightly different distances allows a computer program to "stack" the images into a single photo in which the entire length of the subject can be in focus. As my first subject, I chose a golden bupesprid beetle from my 30-year-old collection. The one photo represents 133 two-second-long exposures spaced along the subject's ¾-inch length. My second attempt was a tick, reminding everyone that they're out now, waiting on blades of grass to attach themselves first to your clothes and then to you. Capturing photos of tiny insects is hard enough. They move and wander off the set. They're so high contrast they can cause exposure control to go whacky. They are so small that auto-focus often selects the background. If all that weren't enough, add motion — photos of insects on the wing are tricky. F stops need to be deep to counter the critters' moving in and out of focus, and ISO has to be slow to keep graininess to a minimum. Both of which make for long exposures, which make for blurry photos. Forced flash can be used to stop motion. It is a balancing act in real time. There is a large dose of luck involved, but familiarity with a critter's behavior helps. Hover flies do indeed hover, sometimes giving the photographer time to manually focus on them if you can find them in the viewfinder. If you catch one illuminated by a shaft of light against a dark background, the photo can work. Some species of dragonfly patrol along a specific route. Spend a little time watching and you may be able to position yourself at a choke point, pre-focus there and snap the shot as it passes. 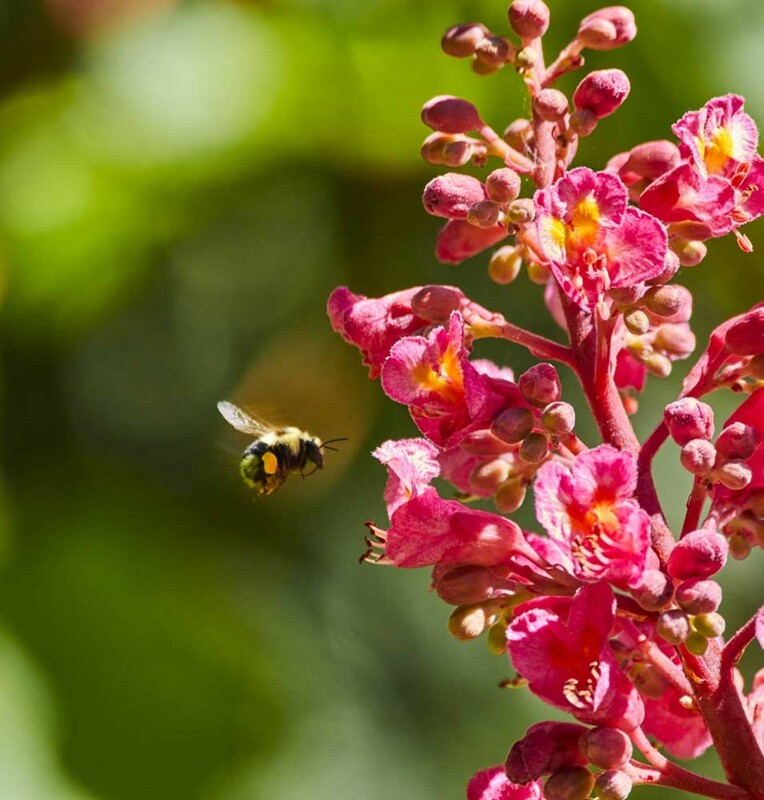 Nectar-sipping insects can be photographed as they approach or leave flowers. Some butterflies are territorial, giving you the opportunity to catch them as they engage an interloper or potential mate. It may sound like a fortune cookie slogan but in insect photography, as in so many other things, "Experience allows us to take advantage of luck."